Members Preview, Saturday, April 13, 6:30-8 pm. Enjoy catering by Cowgirl Barbecue and music by the Free Range Ramblers. Memberships available at the door. Grand Opening, Sunday, April 14, 1-5 pm. 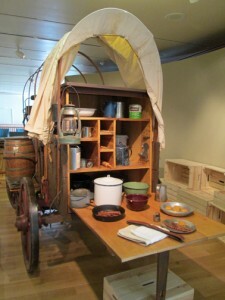 Take special tours of the exhibit and try out your roping skills on a dummy calf. Santa Fe’s JD Noble, who has been forming western hats for nearly 30 years, will joining us to show some of the tools used to make cowboy hats and explain how hats are sized and fitted. Using a steamer, he’ll show his conformateur, a wonderful 19th-century device used to measure head sizes precisely. Take home a small sample of hat felt and use your imagination to design your own cowboy hat. At 2 pm, guest curator B. Byron Price, director of the Charles M. Russell Center for the Study of Art of the American West at the University of Oklahoma and director of the University of Oklahoma Press speaks on “The Making of a Cowboy Hero” in the History Museum Auditorium. After the Civil War, Theodore Roosevelt, Owen Wister, Frederic Remington, William F. “Buffalo Bill” Cody, and Charles Russell, saw in cowboys an icon that could unite a divided nation. Together and individually, they transformed him into a figure who carried a nation’s values, morals and courage. A healthy dose of romance mixed with authenticity, he captured the nation’s imagination and left the hearts of little boys (and quite a few little girls) yearning for horse-backed adventures in a frontier West. From 3-5 pm, enjoy refreshments courtesy of the Women’s Board of the Museum of New Mexico and live music by Bill Hearne from 3-5 pm. The whole afternoon is free with admission (Sundays free to NM residents). While in the Gathering Space, buckaroos can also climb aboard a saddle, practice lassoing a wooden calf, and try on clothes typical to the cowboy trade. Inside the exhibit, visitors can check out a variety of listening stations loaded with cowboy poetry, songs, and oral histories collected by our favorite aural historian, Jack Loeffler. 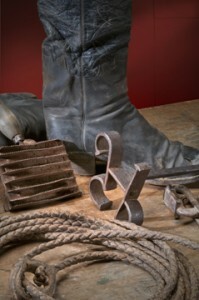 Among the artifacts you’ll see are the Bell Ranch chuck wagon; a small horse trailer rescued from mud and rust in eastern New Mexico; cowboy clothing from the 1700s through modern times; ephemera from the dude ranches that once speckled the state; legendary cowgirl Fern Sawyer’s bodacious red boots; artwork by the likes of Frederic Remington, Theodore van Soelen, Tom Lea, Peter Hurd; and a cache of rare glass-plate negatives made by Ella Wormser. The wife of a Jewish merchant in Deming, NM, Wormser captured what may be the only visual evidence of trail drives making the transition to rail transport in the early 1900s. Altogether, the efforts are designed to create an immersive and interactive environment that finally confirms what we always hoped to be true: Anyone can be a cowboy. 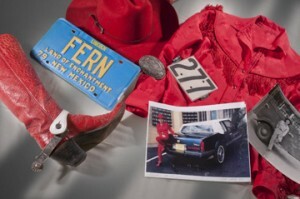 Top and bottom photos by Blair Clark, New Mexico Department of Cultural Affairs.